Liverpool vs Manchester City: Liverpool host Manchester City at Anfield with both teams looking to move three points clear of the other at the top of the Premier League. The Reds suffered their second defeat of the season in midweek as they lost 1-0 away at Napoli in the Champions League. That result leaves Jurgen Klopp’s side without a win in three games, having lost and drawn to Chelsea last week. Had it not been for Daniel Sturridge’s late equaliser at Stamford Bridge, Liverpool would be facing the champions on the back of three straight defeats. A lot has been made of Mohamad Salah’s form in recent weeks. The Egyptian forward, who netted 36 goals last season, has scored just three times in ten games this time around. Salah’s movement has not been as sharp, with many suggesting he is still haunted by the injury that forced him off in the Champions League final last May. Whatever the issue, Liverpool need Salah back at his best if they are to defeat Manchester City again. He was instrumental in their three victories over Pep Guardiola’s men last season, alongside Sadio Mane and Roberto Firmino. City picked up their first win in the Champions League after a 2-1 win over Hoffenheim in Germany. David Silva completed their comeback with three minutes remaining after they’d fallen behind after a minute of the game. City currently lead the way in the league, although only goal difference separates them and the Reds. Kevin de Bruyne is back in training, although Guardiola refused to reveal whether the Belgian would play any part in the match this weekend. They will be without Fabian Delph, whilst there are also doubts over the fitness of Benjamin Mendy. The Citizens are unbeaten on the road this season, dropping just two points at Molineux this term. They’ve also scored 12 goals in their last four games, conceding once. Martin Atkinson is the referee for Sunday afternoon’s clash. The Englishman has officiated seven top-flight matches this season, accumulating an average booking points total of 35.7. Therefore, I would advise a maximum of 60+ for this fixture. This game has a lot to live up to, after the classics we witnessed last season. Given the hectic schedules over the last few weeks, I can see this becoming a tense, tactical battle. As a result, I’m going for a draw in this game, which would probably suit both managers. 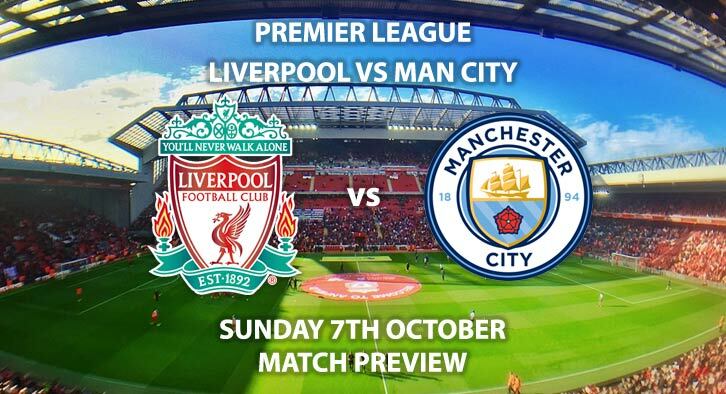 Liverpool vs Manchester City will be televised live in the UK on Sky Sports Main Event at 16:30 GMT. Correct score: 1-1 Draw – (link no longer available). Both Players To Score – Sergio Aguero and Sadio Mane – 8/1. Full Time Result and Both to Player to Score – Draw and Both To Score Yes – 3/1. To score in 90 minutes – Raheem Sterling – 9/4. Odds and markets last updated on Sunday 7th October 2018 @15:50 GMT.